What is an Engine Lathe? - Machinery Resources International Inc.
An engine lathe is a type of machinery, shaped horizontally, and it is often used to cut metal. The metal is turned, and the machine uses special cutting tools to create the desired shape. Because of the lathe, it can create various specific forms and is commonly used to spin sheet metal. Cut pieces are involved in automobile engines, machine engines, or any other engine for a motorized vehicle. Even though it made its debut in the 19th century in blacksmith shops, the engine lathe is still a favorite machine today. While it’s primarily used for spinning and creating these specific designs, you can also utilize it for drilling, to create square blocks, and shafts. It can also produce items such as forge burner nozzles, foundry pattern core boxes, or prints. Engine lathes are an excellent tool, which aids in the creation of many modern tools. For anyone that owns an engine lathe, it is easy to produce devices at home or in-shop. An engine lathe is also known as a reproductive machine because it has many production capabilities. Primary features of an engine lathe are gears, a stepped pulley to operate spindle speeds, tailstock, and a carriage. The gears work to power the transport, which cushions the cutting tools. A tailstock will support hole-drilling within the spindle. Shaping tools can be manually operated or driven with gears. A conventional engine lathe will also include a compound rest and cross-slide for angular and cross cutting. In the days of a 19th-century blacksmith, the carriage would trap dust and dirt, which can be removed later. Today, machinists have an easier time as the carriage is self-oiling at both the front rear. The carriage is also made to protect the machine from the debris of the parts that it produces. 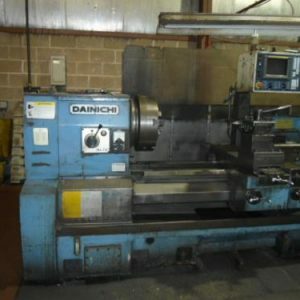 If you or your business are looking for the finest quality engine lathes for sale, then look no further than Machinery Resource International. Based in Los Angeles, Chicago, and Toronto, MRI is a full-service machinery dealer that serves the manufacturing industry with quality, pre-owned machines. Both domestic and international businesses have helped Machinery Resources become a well-known company with almost 60 years of combined experience. MRI specializes in only the best and latest models with high-value CNC and large capacity. Machines such as CNC lasers, Blanchard grinders, conventional milling and turning machines, metal fabrication, and even hard-to-find equipment. MRI primarily caters to the aerospace, defense, automotive, small part and medical industries. If you are looking to upgrade old equipment, we buy any device – or an entire plant. Join an auction or call us directly. Whether you need a new or used engine lathe, MRI’s expert team is always there to help you make the best decision.